Regardless of what the beast actually was, it made a very real impact on the province of Gevaudan when it began slaying numerous citizens, mostly women and children. Between the years 1764 and 1767, there were 210 reported attacks, of which 113 people were killed. The first attack occurred on June 1, 1764, when a woman was approached by the beast in her cow pasture. Luckily for the woman, the bulls in her pasture ran the beast off. The beast later returned only for the same outcome. The next victim of the beast’s attacks was not as lucky. Jeanne Boulet was attacked by the beast when there were no other people or animals around to defend her. She was the first victim killed by the beast. Becoming frustrated, the King of France sent out his professional wolf-hunter, Antoine de Beauterne to find and kill the animal. Along with forty other hunters and a dozen dogs, Beauterne thought they killed the beast when they killed a six foot long wolf, with fangs 1 ½ inches in length. However, shortly after, these killings continued until a local hunter, Jean Chastel was out hunting and he began reading his bible and praying, when the beast appeared in front of him. With a single shot from his rifle with a silver bullet, he killed the beast. After further examination the body was confirmed to belong to the beast. The beast was gutted and sent to the King of France who displayed the corpse to the public. 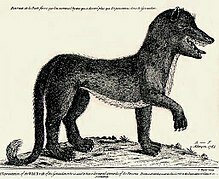 “The Beast of Gevaudan Terrorizes France”. Altered Dimensions. N.p. n.d. Web.16 Oct 2012. Clarke, C. H. D. “The Beast of Gevaudan”. Wolves. N.p. Web. 1971. 16 Oct 2012. “The Cryptid Zoo: Beast of Gevaudan”. New Animal. N.p. Web. 2009. 16 Oct 2012. “Unknown Creatures: Beast of Gevaudan”. Unknown Creatures.N.p.n.d. Web. 16 Oct 2012. “Beast of Gevaudan”. Wikipedia. N.p. Web. 5 Oct 2012. This work provides a detailed explanation of what occurred in the times of the beast. This video shows the entire story of the beast, through good illustrations. This is a compilation of “facts” from various websites.